Living in a condo for many years now, we have always done our best to conserve space. Add in two children with their toys and gear, space became a premium around here. I never knew where exactly to put things like a stroller as it was constantly in the way and even the trendiest stroller looked unsightly. Mary Ann Malone, a New Jersey mom understands the struggle parents face with their baby gear. A few years ago her West Village, NY apartment building received a fire code violation thanks to her son’s stroller parked in the hallway. Unwilling to sacrifice one more inch of space to baby gear, Mary Ann hit the stores looking for a way to hang or otherwise ‘store’ her stroller. Living in a city of over 8 million people, with most being parents living in apartments; where was everybody keeping the strollers? After a fruitless search (and a couple of drill holes through her closet door, Mary Ann set out to invent the StrollAway. The Metro Tots StrollAway is a must have product for families with limited storage space. 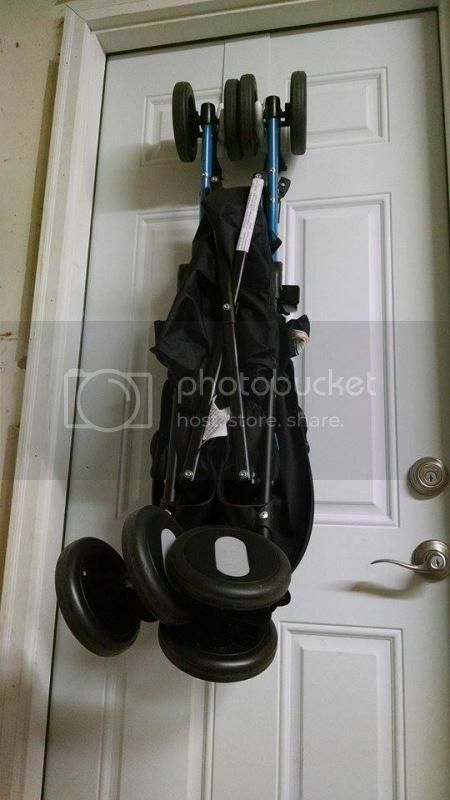 It easily converts to any door and with any stroller. I use mine for our heavy Graco Click Connect or with our lightweight Chicco Echo. There’s no need to screw the hook into the door, making it easy to move around wherever you need it. One of my favorite uses for the StrollAway is taking it along on our travels. When you think your apartment or condo couldn’t feel any smaller, try taking your children along on a trip to a hotel. The StrollAway is made of steel, has adjustable arms and can fit any stroller model up to 40lbs. You can purchase your own Metro Tots StrollAway on Amazon or Diapers.com. Be sure to connect with The StrollAway by Metro Tots on Facebook or on Twitter! How do you keep your home uncluttered from baby gear now? I’m Going to Be an #NJMOM…Now What? I love it! I’ve never had that small a space, but I think anyone would love this stroller. Think of how well it must travel, always the bane of my kids’ toddler & baby days. Nice! BRILLIANT! Need this in my garage. I almost hit my stroller with my car at least once a week. 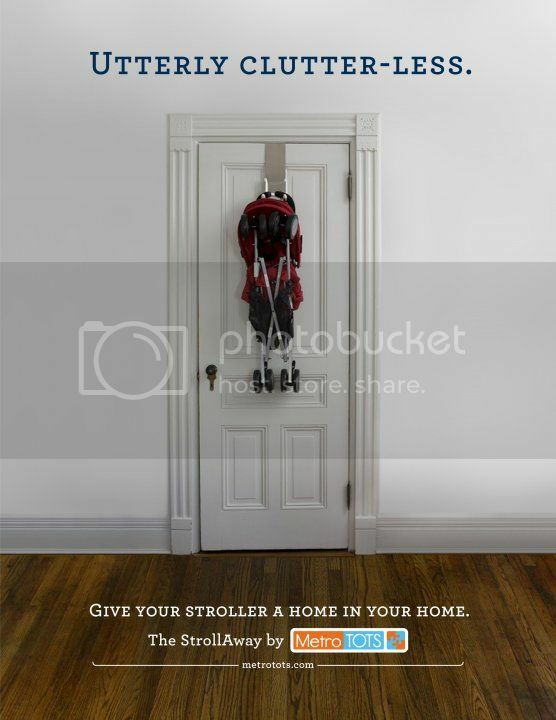 We don’t use strollers anymore, but this is such a handy device especially if you live in an apartment. I am all for anything that gets rid of clutter. what a fantastic idea! I never knew these things existed. I’ve been tripping over mine for months. Oh I need something like this in my life! Our Bugaboo Bee is always in the way, this would make the hub so happy that he isn’t tripping over the pram!!! !